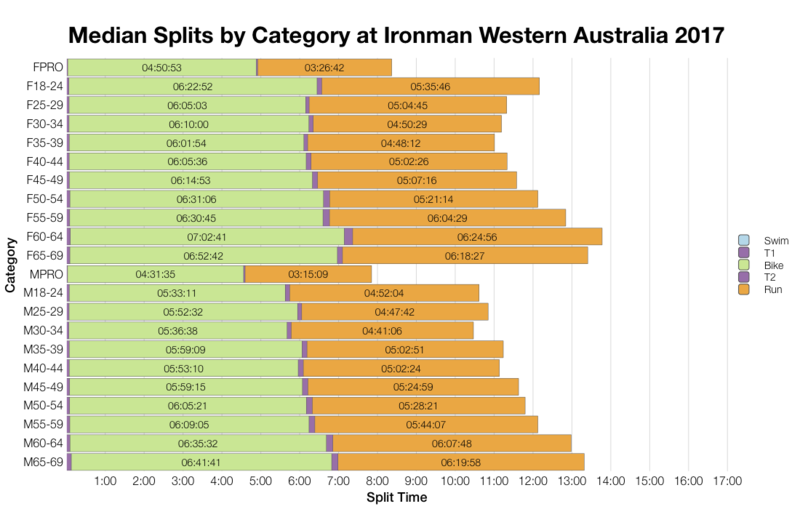 A shark sighting not far from the swim course turned Sunday’s Ironman Western Australia into a duathlon. Obviously that’s going to have a huge impact on any athlete’s day and also carry over into the results. Alongside this last minute change the race also carried extra slots, with 65 on offer over the usual 40. I’m going to put this in bold as it’s important to note before you read any further: to allow a degree of comparison with past results I’ve subtracted swim times from athlete’s overall splits in the historical data. 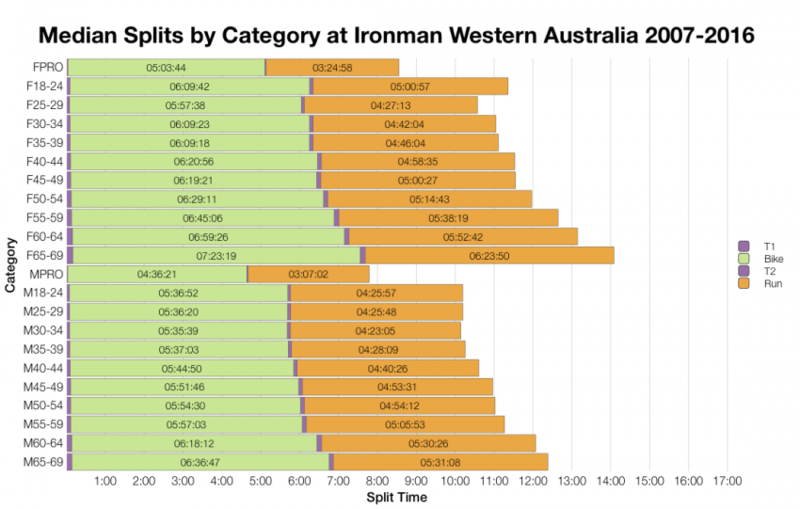 Of course, the impact of a last minute cancellation is more than just the time it takes to swim, but I thought this approach might give some context. 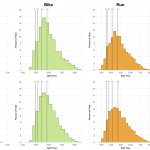 This year’s race trends slower – both bike and more significantly run trail behind past results. 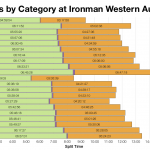 Bike times are mostly impacted at the mid to back of pack, but run times are shifted by 15 minutes across the age group field. When we compare the overall times with the adjusted times from the past decade this was a slower day despite the loss of the swim. Conditions look to have been tough outside of the water too. As well as this slower distribution of splits, the DNF rate for the race was also high. Bike DNF numbers appear to be the highest seen and run DNFs are only beaten by the 2010 race. Conditions for race day were clearly tough enough to eliminate any potential gain from missing an hour or more in the water. Medians reflect the distribution’s trends. 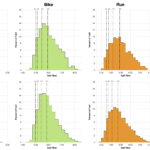 Broadly we see somewhat slower bikes and significantly slower runs. The pros highlight how the front of the field did manage to match or beat previous bike medians, but still the runs were slower. It’s mostly a local race, but Western Australia pulls athletes from around the Pacific and also a good turn out from the UK. Kona slots mostly stayed in Australia. Comparing with adjusted historic times (swim subtracted), we can see how this year’s race is effectively slower. As previously noted, it’s more noticeable further back in the field, those in first place are less affected. Of course, if I used the actual historic times without adjustment we’d see the opposite trend and this year’s race would appear slightly faster. 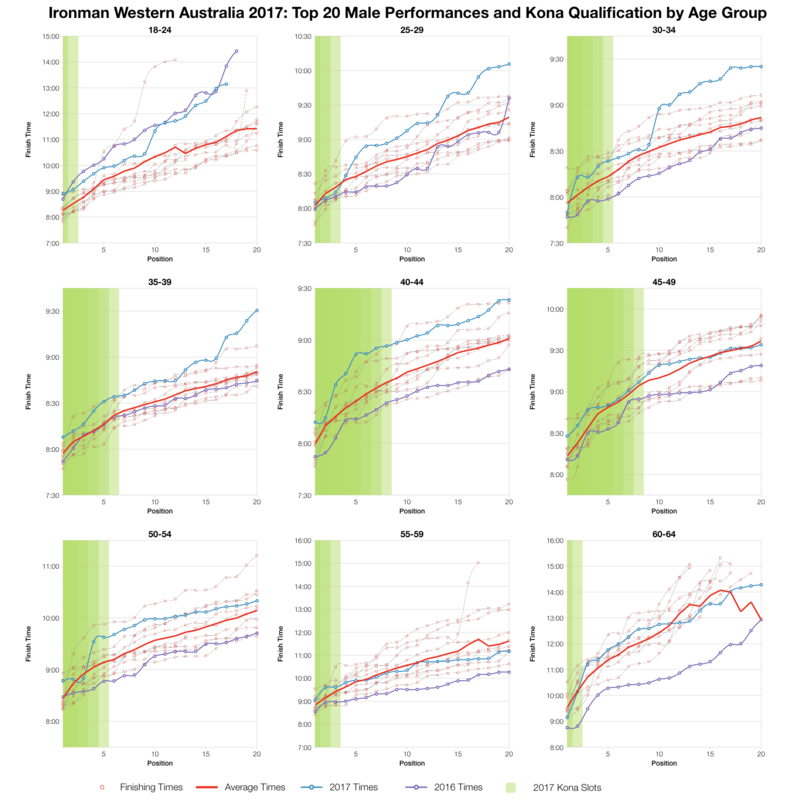 Based on the results list I’ve estimated the Kona slot allocation from each age group and from that the likely automatic qualifying times before any roll down. Actual numbers may vary from this. These times will be faster than normal, but you can compare with other races on my Kona qualification page. Finally, the top twenty in each age group, again comparing against adjusted historical results. 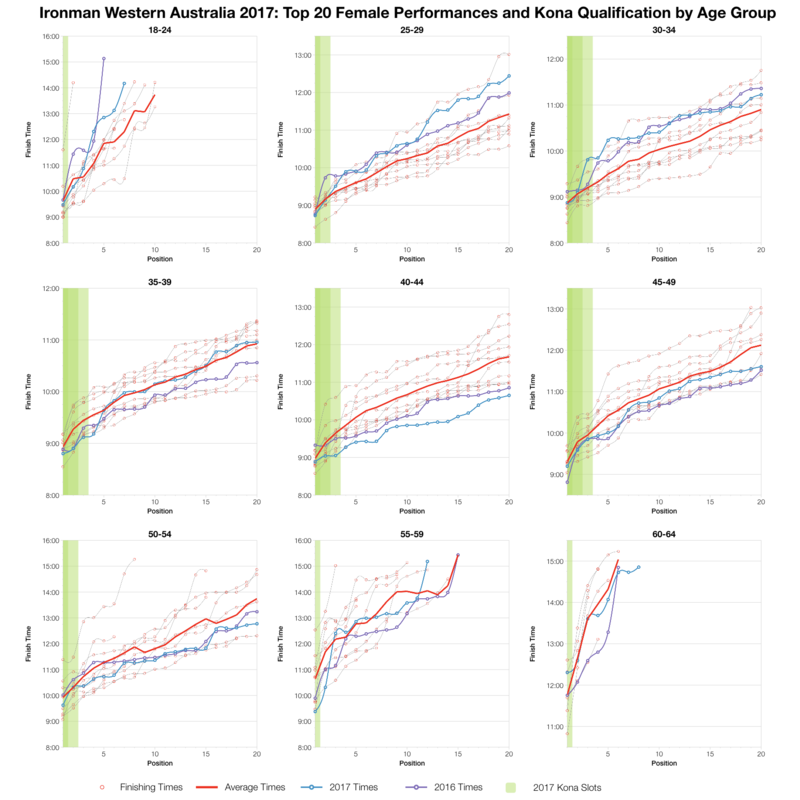 The broad trend is towards a slower race when we only consider the bike and run. 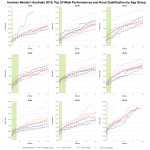 Most age groups come in slightly slower than average with the very front closing in on the averages. There are exceptions, F40-44 performed very well in the conditions and came in ahead of most adjusted times. So the loss of a swim naturally made for faster times than usual on the course, but if we adjust past results and remove the swim element, this year’s race actually looks to have been a bit slower. Conditions in the water prevented a swim, but those on dry land made for a tough day of racing. You can access a spreadsheet of the full results from Ironman Western Australia 2017 on my Google Drive.